(Spanish American War Patriotic) Uncle Sam "On to Puerto Rico. 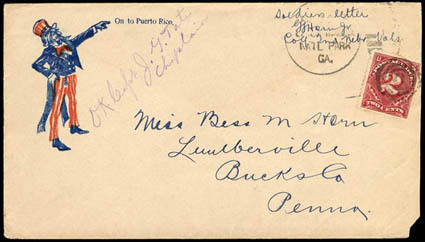 ", red and blue patriotic design on cover endorsed "Soldiers letter" with "Natl Park Ga." duplex to Lumberville, Bucks Co., Pa., purple "OK, Capt J. G. Tate, Chaplain" endorsement at top left, 2¢ postage due affixed and tied by four-rings cancel upon arrival; corner nick and reduced slightly at right just affecting due, Very Fine. A link back to Sale 75 - Lot 182, along with its description, will be appended to your message.